Corporate "Day in the Dirt"
Non-Profit "Day in the Dirt"
Join our group of Saturday volunteers to complete large-scale horticulture and maintenance projects in various areas throughout the Park. Projects may include raking, mulching, pulling weeds, planting, and other landscape maintenance projects. Besides helping the Park by volunteering, you're helping yourself with a physical workout! Sessions take place every Saturday year-round, from 10:00 am to 1:00 pm. We provide all on-site guidance and necessary tools, including gloves. No commitment is required. Come once, or come many times! For your safety, please wear sturdy closed-toe shoes and long pants. Sign-ups open approximately one week before each session, and space is limited. The day before the session, you will receive an email with the meeting place and project details. Adults and kids 9th grade or older are welcome. 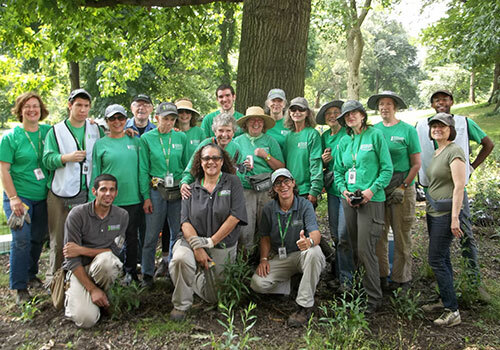 New Applicants: Please click here to fill out a Central Park Conservancy Application, indicating your interest in the Saturday Green Team. NOTE: If you have previously created an online volunteer profile, please do not create a new one. If you do not remember your log-in information, contact the Volunteer Department at: volunteer@centralparknyc.org.